The history of the United Nations as an international organization has its origins in World War II. Since then its aims and activities have expanded to make it the archetypal international body in the early 21st century. The earliest concrete plan for a new world organization to replace the ineffective League of Nations began under the aegis of the US State Department in 1939. On 12 June 1941, representatives of the United Kingdom, Canada, Australia, New Zealand, the Union of South Africa, and of the exiled governments of Belgium, Czechoslovakia, Greece, Luxembourg, Netherlands, Norway, Poland, and Yugoslavia, as well as General de Gaulle of France, met in London and signed the Declaration of St. James's Palace. This was the first of six conferences that led up to the founding of the United Nations and the Charter of the United Nations. U.S. President Franklin Roosevelt first suggested using the name United Nations, to refer to the Allies of World War II, to British Prime Minister Winston Churchill during the latter's three-week visit to the White House in December 1941. Roosevelt suggested the name as an alternative to "Associated Powers", a term the U.S. used in the First World War (the U.S. was never formally a member of the Allies of World War I but entered the war in 1917 as a self-styled "Associated Power"). Churchill accepted the idea and cited Lord Byron's use of the phrase "United Nations" in the poem Childe Harold's Pilgrimage, which referred to the Allies at the Battle of Waterloo in 1815. 1942 "Declaration of United Nations"
The text of the "Declaration by United Nations" was drafted by U.S. President Franklin D. Roosevelt, British Prime Minister Winston Churchill, and Roosevelt aide Harry Hopkins, while meeting at the White House on 29 December 1941. It incorporated Soviet suggestions, but left no role for France. The first official use of the term "United Nations" was on 1–2 January 1942 when 26 Governments signed the Declaration. One major change from the Atlantic Charter was the addition of a provision for religious freedom, which Stalin approved after Roosevelt insisted. By early 1945 it had been signed by 21 more states. (1) Each Government pledges itself to employ its full resources, military or economic, against those members of the Tripartite Pact and its adherents with which such government is at war. (2) Each Government pledges itself to cooperate with the Governments signatory hereto and not to make a separate armistice or peace with the enemies. The foregoing declaration may be adhered to by other nations which are, or which may be, rendering material assistance and contributions in the struggle for victory over Hitlerism. During the war, the United Nations became the official term for the Allies. To join countries had to sign the Declaration and declare war on the Axis. Early United Nations official's passport from World War Two - working for UNRRA, issued in 1944 for the Middle East. The idea for the future United Nations as an international organization emerged in declarations signed at the wartime Allied conferences: the Moscow Conference and the Tehran Conference in 1943. From August to October 1944, representatives of the Republic of China, Britain, the US and the USSR met to elaborate plans at the Dumbarton Oaks Conference in Washington, D.C. Those and later talks produced proposals outlining the purposes of the United Nations organization, its membership and organs, as well as arrangements to maintain international peace and security and international economic and social cooperation. Governments and private citizens worldwide discussed and debated these proposals. Winston Churchill urged Roosevelt to restore France to its status of a major Power after the liberation of Paris in August 1944. At the Yalta Conference it was agreed that membership would be open to nations that had joined the Allies by 1 March 1945. Brazil, Syria and a number of other countries qualified for membership by declarations of war on either Germany or Japan in the first three months of 1945 – in some cases retroactively. The UN in 1945. In light blue, the founding members. In dark blue, protectorates and colonies of the founding members. On April 25, 1945, the United Nations Conference on International Organization began in San Francisco. In addition to Governments, a number of non-government organizations, including Rotary International and Lions Clubs International received invitations to assist in the drafting of a charter. After working for two months, the fifty nations represented at the conference signed the Charter of the United Nations on 26 June. Poland, which was unable to send a representative to the conference due to political instability, signed the charter on 15 October 1945. The charter stated that before it would come into effect, it must be ratified by the Governments of the Republic of China, France, the USSR, the United Kingdom, and the United States, and by a majority of the other 46 signatories. This occurred on 24 October 1945, and the United Nations was officially formed. The first meeting of the General Assembly was held in Westminster Central Hall, London, on 10 January 1946. The Security Council met for the first time a week later in Church House, Westminster. The League of Nations formally dissolved itself on 18 April 1946 and transferred its mission to the United Nations. The United Nations has achieved considerable prominence in the social arena, fostering human rights, economic development, decolonization, health and education, for example, and interesting itself in refugees and trade. The leaders of the UN had high hopes that it would act to prevent conflicts between nations and make future wars impossible. Those hopes have obviously not fully come to pass. From about 1947 until 1991 the division of the world into hostile camps during the Cold War made agreement on peacekeeping matters extremely difficult. Following the end of the Cold War, renewed calls arose for the UN to become the agency for achieving world peace and co-operation, as several dozen active military conflicts continued to rage across the globe. The breakup of the Soviet Union has also left the United States in a unique position of global dominance, creating a variety of new problems for the UN (See the United States and the United Nations). In December 1945, the US Senate and the US House of Representatives, by unanimous votes, requested that the UN make its headquarters in the United States. 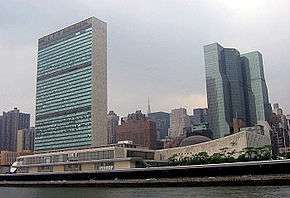 The UN accepted this suggestion and, after considering sites in the Black Hills, Flushing Meadows–Corona Park, Navy Island and what would become the World Trade Center site, constructed the United Nations headquarters building in New York City in 1949 and 1950 beside the East River on land purchased with an $8.5 million donation from John D. Rockefeller, Jr. The UN headquarters officially opened on January 9, 1951, although construction was not formally completed until October 9, 1952. Under special agreement with the United States, the UN enjoys certain diplomatic privileges and immunities, but generally the laws of New York City, New York State, and the United States apply. 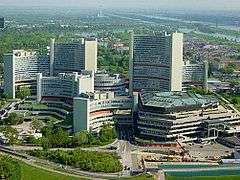 While the principal headquarters of the UN remain in New York City, major agencies base themselves in Geneva, The Hague, Vienna, Nairobi and elsewhere. The basic constitutional makeup of the United Nations has changed little, though vastly increased membership has altered the functioning of some elements. The UN as a whole has generated a rich assortment of non-governmental organizations and special bodies over the years: some with a regional focus, some specific to the various peacekeeping missions, and others of global scope and importance. 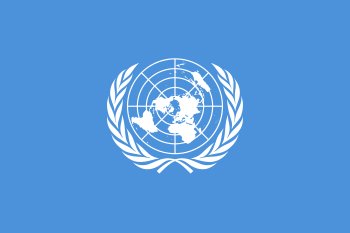 Other bodies (such as the International Labour Organization) formed prior to the establishment of the United Nations and only subsequently became associated with it. In October 2015 over 350 landmarks in 60 countries were lit in blue to commemorate the 70th anniversary of the world body. Clark, Ian, and Christian Reus-Smit. "Liberal internationalism, the practice of special responsibilities and evolving politics of the security council." International Politics (2013) 50#1 pp: 38-56. Ferdinand, Peter. "Rising powers at the UN: an analysis of the voting behaviour of brics in the General Assembly." Third World Quarterly (2014) 35#3 pp: 376-391. Phillips, Walter Ray. "United Nations Educational, Scientific and Cultural Organization." Montana Law Review 24.1 (2014): 2. ↑ "1941: The Declaration of St. James' Palace". United Nations. Retrieved 28 March 2016. ↑ "United Nations". Wordorigins.org. 3 February 2007. Retrieved 28 March 2016. ↑ Ward, Geoffrey C.; Burns, Ken (2014). "Nothing to Conceal". The Roosevelts: An Intimate History. Knopf Doubleday Publishing Group. ISBN 0385353065. ↑ Edmund Jan Osmańczyk (2003). Encyclopedia of the United Nations and International Agreements: T to Z. Taylor & Francis. p. 2445. ↑ Text from "The Washington Conference 1941-1942"
↑ "History of the United Nations 1941 - 1950". United Nations. Retrieved 12 March 2015. ↑ "What is the Security Council?". United Nations. Retrieved 12 March 2015. ↑ "World lights up in UN blue to mark Organization's milestone anniversary". UN News Centre. 22 October 2015. Retrieved 25 October 2015. ↑ "Over 200 Landmarks to Light Up UN Blue on 70th Anniversary". The New York Times. 23 October 2015. Retrieved 25 October 2015. ↑ "Turn the World #UNBlue". United Nations Information Centres. Retrieved 25 October 2015. 1 Provisional Secretary-General prior to the election of Trygve Lie. • 2 Secretary-General designate, due to take office in 2017.